Considering its location among some of Louisiana’s oldest municipalities, Kaplan boasts a relatively short history. Situated 20 miles southwest of Lafayette and ten miles west of Abbeville, this small town lies at the epicenter of a lucrative rice industry that has transformed the region from swampland into an agricultural hub. 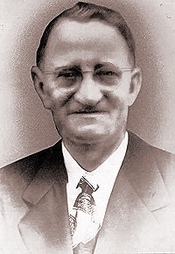 Abrom Kaplan, a local Jew and agriculture tycoon, founded the town in 1903 after purchasing the land from a plantation that had recently closed. To attract an active workforce to the area for his rice mills, he gave away parcels of this fertile land to families. Abrom Kaplan also lobbied local railroad officials to extend the tracks from Gueydan to Kaplan and Abbeville, which contributed significantly to the town’s development. Amidst the town’s growth, a few Jews made their homes in Kaplan, including the Jack Kaplan and Tartak families, and became active members of Congregation Gates of Prayer in nearby New Iberia. Yet despite Abrom Kaplan’s important role in the regional Jewish community, most residents of the town over the past century have not been Jewish but rather French-speaking descendants of Acadians. In the 20 years before the town’s incorporation, Abrom Kaplan had become a pioneer in Southwest Louisiana’s rice industry. He emigrated from Poland in 1885, after having spent his adolescence working in cigar and furniture businesses. After settling in Crowley, Kaplan opened a small store and speculated in real estate. He developed land, established local banks and credit unions, and financed the excavation of irrigation canals. Most significantly, Kaplan developed a crucial flood control method to keep salt water out and let bayou water in, allowing the rice crop to thrive across the region. Using this innovative irrigation system, Kaplan opened rice mills throughout Crowley, Abbeville, Gueydan, and several other towns west of the Mississippi River. By the turn of the century, Kaplan was known as one of the region’s foremost industrialists, as well as southwest Louisiana’s largest tax-payer. As such, Kaplan began to represent the interests of rice farmers with prominent legislators both locally and nationally. In 1922, Kaplan went to Washington to attend a conference with Secretary of Agriculture Henry C. Wallace, and even dined with President Harding. As Abrom Kaplan built his fortune, he began to bring his relatives to Southwest Louisiana. In 1915, Abrom paid for his nephew, Jack Kaplan, to immigrate to the United States from Poland. Jack worked under the tutelage of his uncle Abrom for two decades and by 1935, Jack and his brother-in-law Abe Tartak bought Liberty Rice Mill, one of Abrom’s many mills in the region. At the time of Abrom’s death in 1944, the Kaplan family owned the largest rice irrigation system in the world. Despite the lack of Jews in town, Abrom Kaplan still strived to remain connected to the Jewish community. While Kaplan itself never had a permanent synagogue or Jewish cemetery, Abrom served as an officer of the Jewish Cemetery Association in Lafayette, where he was later buried. When Kaplan died, moreover, religious services were held at the Crowley Mason Lodge, which was said to have functioned temporarily as a synagogue for the few Jews in town. Kaplan’s first wife, Rebecca Lichtenstein of New Orleans, was also active in the area's Jewish life as a member of both the Crowley Chapter of the Order of the Eastern Star and the Jewish Sisterhood of Congregation Gates of Prayer in New Iberia. At the same time, Kaplan’s small Jewish population was well integrated in the larger community. Abrom Kaplan helped fund the creation of several churches in the town, including the Kaplan Baptist Church. His grandson and son-in-law also helped fund the town’s Holy Rosary Catholic Church in later years. At its peak, the town of Kaplan served as a major shipping hub, complete with a post office, Catholic Church, school, telegraph company, and town newspaper. ​Today, Kaplan is known affectionately as the “gateway to the coastal wetlands” and occasionally as “the most Cajun place on earth.” Few if any Jews still live in the small town of 4,500 residents, many of whom still work for the rice industry. The town instead celebrates the French-Cajun heritage of its populace. Each July since 1906, Kaplan has hosted the largest public celebration in Louisiana of Bastille Day, the French national holiday celebrating the famed uprising on the eve of the 1789 French Revolution. Events at the festival include greased pig chases, political speeches, Cajun fais-do-do dances, and a re-enactment of the storming of the Bastille. The presence of the Kaplan family has abated significantly; however, the legacy of Abrom Kaplan lives on. One descendent of Abrom, Connie Kaplan, served as the editor of the local newspaper for several decades in the late 20th century. Several years ago, Jack Kaplan donated some of the family’s land to build the Abrom Kaplan Memorial Hospital of Kaplan, one of the most modern medical facilities in Southwest Louisiana. Kaplan’s Planters Rice Mill, too, continues to function today, a subtle reminder of the Jewish past of Kaplan.